To protect a local high school, Rockfall Barriers and HEA Panels were placed in the proximity of a highway tunnel. 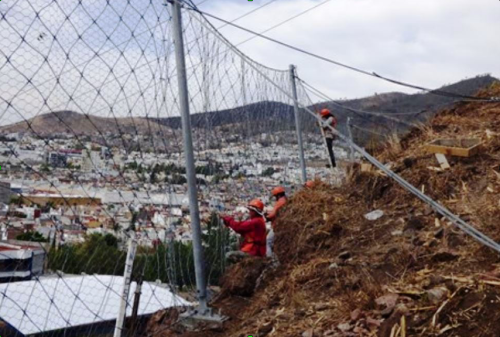 In Morelia, a city in the state of Michoacán, Maccaferri Mexico supplied a set of rockfall products to protect one of the two road tunnels that are servicing the city beltway, located in the southern urban area. Built with the aim of cutting transfer times for commuters and therefore the emissions from vehicles, the South Morelia Beltway is featuring two tunnels, one of which required rockfall protection applications to prevent potential incidents due to the vibrations caused by the tunneling development works. To this end, the contractor designers from the municipal transport department (Centro SCT Michoacán) decided to deploy a protection structure based on our dynamic catch fences and HEA Panels. With an energy absorption capacity up to 8,500kJ, Maccaferri Mexico’s Rockfall Barriers are supplied in a ‘kit form’: all components (except ground anchors) are provided in the kit, including panel mesh, anchor posts, footing plates, brakes, cables, and clips. High Energy Absorption (HEA) Panels are the stiffest products within our Mac.RO Systems mesh range, capable of offering extreme strength at low strain. The panels are woven from a single continuous length of high tensile strength steel wire rope, joined at each crossing point with a patented HEA ‘double knot’ connection. In the proximity of the tunnel, therefore, two dynamic protection barriers were installed for protection of a Technical High School. The works were carried out in April-May 2016. To discover more about our rockfall protection applications, please contact us.